This entry was posted on Sunday, January 9th, 2011 at 19:02 and is filed under Computer. You can follow any responses to this entry through the RSS 2.0 feed. Both comments and pings are currently closed. Those two black groups on the right side are dead as they are. They each have only one eye and there’s no space to make another thus white doesn’t even have to fill the liberties to capture these stones. In this case, at the end of the game, you may have to manually specify the dead stones by clicking on them because the software has some difficulties in judging the stones are dead or alive. 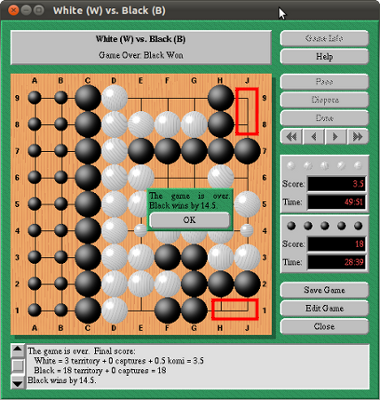 In this game, white wins by a lot because all the right side are white’s territories and the 14 dead black stones have to be filled in black territories.